“Superconductors contain tiny tornadoes of supercurrent, called vortex filaments, that create resistance when they move. This affects the way superconductors carry a current. But a magnet-controlled “switch” in superconductor configuration provides unprecedented flexibility in managing the location of vortex filaments, altering the properties of the superconductor, according to a new paper in Nature Nanotechnology. The collaborators’ solution overlays the superconductor with an artificial spin ice consisting of an array of interacting nanoscale bar magnets. Rearranging the magnetic orientations of those nano-bar magnets results in a real-time rearrangement of the pinning on the superconducting site. This makes possible multiple, reversible spin cycle configurations for the vortices. Spin is a particle’s natural, angular momentum. “The main discovery here is our ability to reconfigure these spinning sites reversibly and instead of having just one spin cycle configuration for the vortices, we now have many, and we can switch them back and forth,” Jankó said. The magnetic charges have the same pinning effect as drilled holes in other systems but are not limited to a static configuration, he described. For example, the magnets could be arranged to create more or less resistance in the superconductor. The elementary unit potentially could be combined into a circuit capable of logic manipulation. Yong-Lei Wang, research assistant professor in the Department of Physics and co-first/co-corresponding author on the paper, who is also affiliated with Argonne National Laboratory and Nanjing University, had previously described an artificial spin structure, or magnetic charge ice, which could be tuned to various relatively stable configurations. The structures are called ice because they involve patterned atomic deformations similar to that of oxygen bonds when water freezes. In the current study, Jankó proposed applying the system to superconductors. 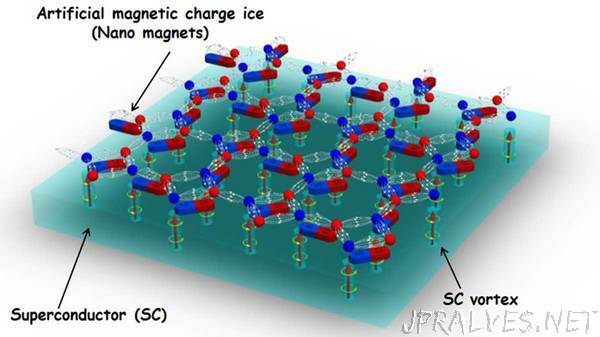 “We demonstrated that unconventional artificial-spin-ice geometries can mimic the charge distribution of an artificial square spin ice system, allowing unprecedented control over the charge locations via local and external magnetic fields,” Wang said. “We show now that such a control over magnetic charges can be exploited in the control of quantum fluxes in a spin-ice/superconductor heterostructure.” He added that the success resulted from close collaboration between experimentalists and theorists. The research is expected to provide a new setting at the nanoscale for the design and manipulation of geometric order and frustration — an important phenomenon in magnetism related to the arrangement of spins — in a wide range of material systems, Wang noted. These include magnetic skyrmions, two-dimensional materials, topological insulators/semimetals and colloids in soft materials. In addition to Jankó, Wang and Ma, other authors on the paper include Jing Xu, Zhi-Li Xiao, Alexy Snezhko, Ralu Divan, Leonidas E. Ocala, John E. Pearson and Wai-Kwong Kwok of Argonne National Laboratory.